The Terror Trap: Reflections on Fear: C.H.U.D. Buried below the buckle of the Bible belt as a little boy, you better believe New York City was as chimerical of a locale as I was ever going to imagine. Nothing felt more foreign to my rural-suburban upbringing than that sprawling metropolis presented on our television set night after night. Taxi. Diff’rent Strokes. Welcome Back, Kotter. 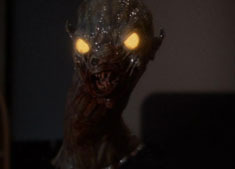 But like most impressionable-minded youngsters scattered across our fair flyover states during the early 80's, my foremost exposure to the Big Apple was none other than Douglas Cheek’s urban anathema C.H.U.D. - hereunto known to nefarious city officials and horror fans all over as Cannibalistic Humanoid Underground Dwellers. Given its constant late-night rotation on HBO back in the day, no other horror film seared this gritty city into the prepubescent brains of non-New Yorkers everywhere. Does it have anything to do with the numerous crackpot accounts of “monster” attacks happening throughout SoHo? Does it have something to do with the countless number of hazardous chemical containers labeled “C.H.U.D.” stashed in the labyrinthine tangle of unused subway tunnels underground? How does your life differ from those portrayed in the movie? What separates you from the characters you just watched getting slaughtered? If there is any overlap, what is it - and how can you avoid it from here on out? Having never set foot in New York, the contrast was clear. No C.H.U.D. would attack me because I didn’t live anywhere near that city. Theoretically, there were at least three hundred and fifty two miles between me and the closest C.H.U.D. I was safe from the army of cannibalistically-inclined subterranean bums amassing themselves below the streets of lower Manhattan - so I slept soundly. For the time being. Inside the Statue of Liberty? C.H.U.D.s. Atop the Empire State Building? C.H.U.D.s. Rockefeller Center? C.H.U.D., C.H.U.D., everywhere. I remember walking through Astor Place with my mother one afternoon, my hand in hers. The sunlight can’t reach us because of the tunnel of tall buildings. 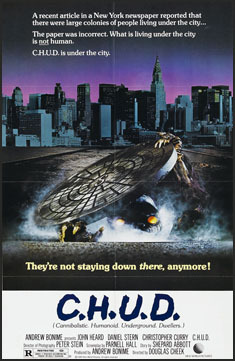 I don’t know it then, but I’m only blocks away from where C.H.U.D. was originally filmed. There was a pop. Pedestrians begin to cluster together. There, at the heart of the commotion...is a man lying in the street. A postman. His upper torso rests on the sidewalk, his legs stretching over the road. I see blood rising up from his uniform. What just happened is the whispering discourse passing through the crowd - but in that moment, I realize this man has been shot. What I’m looking at is a dead body. My first. Say a prayer for that man’s family, my mom says, gripping my hand even tighter. No compare/contrast was going to save me from my nightmares that night.